There are different scaffolding designs that can be used on a construction site. These provide platforms for workers and building materials as they work. These different designs include static and rolling among other designs that we will look into. Scaffolds are not only used for construction purposes, but are also used for repair work; used by window cleaners, form a platform to access high objects and much more. They ensure that everyone working on a construction site is safe so employers must ensure the safety of the scaffolds used by all the employees at the site. They must also be assembled, rearranged and dismantled by those who are qualified. An inspection should be carried out every day after use or any modification to ensure that they are safe. Damaged scaffolds must be repaired first before any work continues. 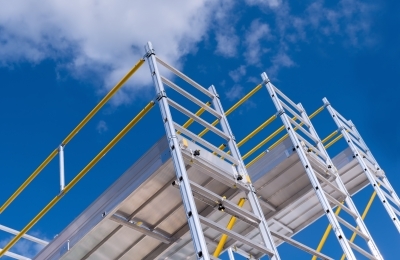 A number of factors are considered before deciding on whether to use mobile scaffolding or not. One should consider the ease of access and the traffic of movement to be used along the scaffolding. Mobile units save a lot in a case that multiple scaffolding structures have to be installed. Time is also saved where in the case of a static one they have to demolish and build afresh after they are done with a site. However, it should be noted that mobile scaffolding has higher risks involved compared to static ones. These types of scaffolds are suspended from a roof or from another tall structure. They are mostly used in the type of construction that putting up a base is not possible or practical. This type of scaffolding is mostly used during repair work on tall buildings and is mostly used by window cleaners. Extra precaution has to be undertaken while using these. Rolling scaffolding uses castor style wheels that are placed under the base to enable movement. While the construction is in progress these wheels need to be securely locked to ensure safety to those working on it and those that are around. This type of scaffolding is suited for constructions that cover a long distance. Supported scaffolding is mostly used in construction work where elevation is required. Acrow props are used in this design and they come in handy because you can adjust them to the height needed. They offer support and can take a lot of weight. This type of scaffolding is considered to be the most convenient and safest. It is also cost effective and saves time and money for both the employer and employees. There are different types of supported scaffolding used in different circumstances. These are usually used on the exterior of a building mostly still under construction. They are propped up to handle both the workers and the construction materials usually two or more floors at time. These Aerial lifts are also used to lift bulky material to the site and can be used my multiple workers at a single time.